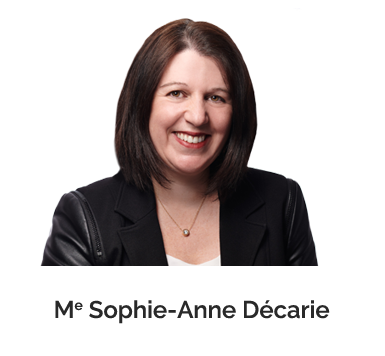 The Décarie Lawyers Notaries firm was founded in May of 2006 by Me Sophie-Anne Décarie and Me Isabelle Fortin, two young driven and dynamic lawyers practicing mainly in civil and commercial litigation. Originally known as Décarie Fortin, Lawyers, the firm has built a solid reputation in civil and commercial litigation through the all-around nuanced, combative and creative attitude of its two founders. Initially quite modest, the firm’s success propelled it toward rapid and strong growth. In September of 2011, following the initial addition of matrimonial law and business law services, positioning itself at the forefront of the profession, the firm took a multidisciplinary turn by adding notarial services. This is how Décarie Fortin, Lawyers Notaries was born in Gatineau; the first firm of its kind in Quebec dedicated to its mission to offer its clients the benefits of providing all the services offered by lawyers and notaries in a single trustworthy firm. In 2012, the firm was a finalist in the “micro-entrepreneur of the year” category of the Regroupement des gens d’affaires de la Capitale nationale. In 2013, the firm received the Excelor prize of the Gatineau Chamber of Commerce aiming to recognize excellence in female entrepreneurship. Over the years, the firm has had to increase the size of its premises three times, and in February 2014, the firm moved its offices to a larger newly renovated office located at 3, Picardie street in Gatineau. In November 2016, the firm was celebrated as “Team of the month” by the Chambre de commerce de Gatineau and was a finalist in the prestigious category “Business of the year” for the Excelors Award of the Chambre de commerce de Gatineau who recognize companies demonstrating the leadership and excellence in the quality of their business processes. In August 2017, the firm completed a new extension of their premises, the fourth since the creation of the firm, always growing. These new improvements to add 5 workspaces allowed new professionals and support staff to be welcomed, and brought the team up to 16 people. On March 23rd, 2017, Décarie Lawyers Notaries presented the first edition of the “Défi des Chefs Leucan Outaouais” which raise $66,000 for this charity and which earned the firm to be named as a finalist for the Excelor Award in the category “Innovation – Exceptional project” of the Chambre de commerce de Gatineau. The second edition of the “Défi des Chefs Leucan Outaouais” having took place on March 22nd, 2018 presented by the firm, raised $105 000.